The Individuals with Disabilities Education Act (P.L. 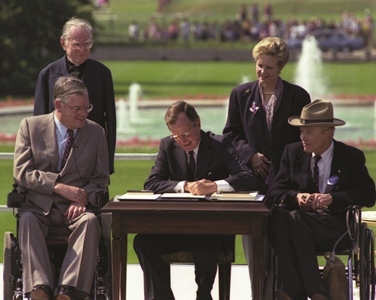 101-476) is signed into law, modernizing the Education of the Handicapped Act. IDEA emphasizes parent and family involvement and states that services should be provided in the least restrictive environment and continues coverage of occupational therapy as a related service and, in early intervention, a primary service. The Omnibus Budget Reconciliation Act of 1990’s (P.L. 101-508) Title VII Allied Health Project Grants Program includes occupational therapy students in new scholarship program for minority and disadvantaged individuals. The law establishes the Center for Medical Rehabilitation Research, creates a National Advisory Board on Medical Rehabilitation Research, and also extends Medicare coverage allowing community mental health centers to provide partial hospitalization mental health services, including occupational therapy. The Americans with Disabilities Act (P.L. 101-336), which prohibits discrimination on the basis of disability, is passed, opening new avenues of service for occupational therapy in areas such as work accommodations and environmental accessibility. The Accreditation Council for Occupational Therapy Education is founded and recognized by the U.S. Department of Education. Joint accreditation with AMA, which began in 1933, is discontinued. ACOTE independently accredits both OT and OTA education programs. AOTA adopts Uniform Terminology–III. The National Office moves to 4720 Montgomery Lane, Bethesda, Maryland, where it is currently located. AOTA hires its first full-time Ethics Officer. The Illegal Immigration Reform and Immigrant Responsibility Act of 1996 (P.L. 104-208) includes new pre-screening certification requirements for foreign health care workers seeking visas. AOTA succeeds in preserving the profession's ability to oversee these requirements for OT practitioners. 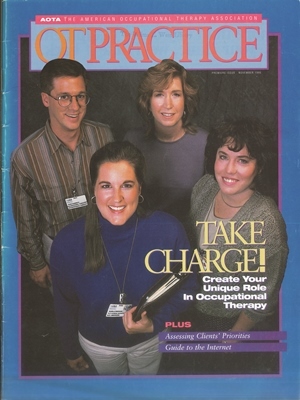 AOTCB becomes the National Board for Certification in Occupational Therapy, Inc. (NBCOT). AOTA adopts the vision statement, “AOTA advances occupational therapy as the pre-eminent profession in promoting the health, productivity, and quality of life of individuals and society through the therapeutic application of occupation.” The Association begins sponsoring systematic reviews, which now inform the Occupational Therapy Practice Guidelines Series. ACOTE establishes a post-baccalaureate entry for OTs, with all schools to become compliant by 2007. The legal dispute that began in 1996 between NBCOT and AOTA over the NBCOT trademarking of OTR and COTA ends. 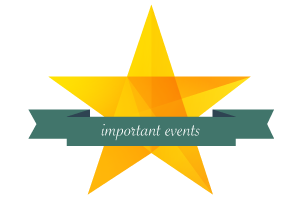 Important events in the history of the occupational therapy profession.